Email marketing is one of the oldest and most effective forms of online marketing. A well executed email marketing strategy can enable you to deliver customized ads, promos and deals to both prospective and current customers. This can enable you to generate leads, convert the leads and create a loyal customer base. Unfortunately, when carried out sloppily, email marketing can actually backfire. Poorly crafted promotional emails can end up being flagged off as “spam”. This can not only prevent your message from getting across, it can actually hurt your brand. In the end, sloppy email marketing can put off both current and prospective customers, and ultimately diminish your competitiveness. In order to enjoy the benefits and minimize downsides of email marketing, you need to be smart about it. This is where email marketing best practices come in. Best practices are techniques which have been refined over the years. Most were discovered by accident, and then perfected by successful email marketing agencies. The biggest challenge in email marketing is getting emails actually delivered into your recipients’ inboxes. This is because most webmail providers (e.g. Gmail, Yahoo! Mail and Outlook) have sophisticated filters designed to filter out spam mail. If you are not careful, your emails can end up in the spam folder. In email marketing, getting your email delivered to a spam folder is game over. This is because most people even don’t bother reading such emails. As such, you have to take every measure to ensure that your emails go into the user’s inbox. The best way to ensure this is through managing the email sender’s reputation. Now, one of the major categories of spam filtering used by webmail providers is called “reputation filtering”. This filtering is based on the reputation of the sender. In this context, the “sender” refers to the server from which the email is sent (not the person who sent it). There are two aspects of the sender which are relevant to reputation. The first is the IP address, and the second is the domain name. Technically, these are usually referred to as “IP reputation” and “domain reputation”. A sender’s IP reputation, for instance, either be positive or negative. Emails from senders with a negative reputation are often flagged off and sent into the recipients’ spam folder. Only emails from senders with a positive reputation are delivered into the recipients’ inbox. To ensure that your emails arrive, you need to send them from IP addresses and domain names which are reputable. There is a free online service which you can use to find out the reputation of an IP address or domain name. This service is called SenderScore. SenderScore is invaluable especially when you are using third-party services e.g. MailChimp or SendGrid to send your emails. You can use it to gauge the reputation of their IP addresses and ensure that your emails are being delivered. Email marketing success often comes down to one thing i.e. the quality of emails. This is because almost every aspect of marketing from lead generation to conversion is carried out by email. As such, being able to create effective emails is critical to overall success. Unfortunately, creating an email from scratch isn’t a trivial undertaking. Thinking about aspects like subject line, opening statements, images to embed, calls to action, link proximity among many other things can be an undertaking. Given the different categories of emails you have to send, designing your own can become a chore. The trick that successful email marketers employ is using email templates. There are lots of email templates which have been refined over the years. This includes templates for lead generation, closing the sale, following up, handling customer complaints, etc. Most of these templates are actually in the public domain. Successful email marketers make a large collection of these templates. Whenever they want to create an email, they simply edit the template. This not only reduces the overall time spent in creating emails, such emails tend to be more effective because the templates are based on tried and tested approaches. Email marketing often involves a complex set of activities. At a minimum, you have to gather email contacts, compose the emails, send them to your respective recipients, carry out analytics, and so on. The worst part is that there are times when you need to conduct these simultaneously. The entire process can be tiresome. The good thing is that some of the activities can be automated. For instance, you can simplify list building by enabling people to sign-up on your website and having their emails instantly added to your mailing list. Similarly, you can create email autoresponders to automatically reply to certain types of email queries. To enjoy such benefits, you need to find an email marketing service provider. Examples of such service providers include MailChimp, Aweber, SendGrid and Constant Contact. These simplify certain email marketing activities such as creating emails (most have lots of templates), building mailing lists, sending emails, tracking emails, A/B split testing, and carrying out analytics. Such service providers maximize the effectiveness of email marketing. This is because they simplify most activities and even automate others. The best part is that most use IP addresses with positive reputations or have the option to “warm” up your IP which can then assist in building up your reputation. As such, on top of simplifying your life, they guarantee that your emails reach your target recipients’ inboxes. To succeed in email marketing, analytics is essential. Analytics is important for tracking the overall progress of an email marketing campaign. It is also important for judging the effectiveness of different aspects of your marketing strategy. For instance, analyzing aspects like the rate of email delivery, number of emails opened, and number of email click-throughs can give you insights about your sending channels or quality of emails. Aspects like the bounce rates or time-on-site on your landing pages can give you an idea about how potential customers perceive your landing pages. Analytics basically enables you to gain important inferences which you can use to make informed decisions. At a minimum, it can help you to find out what is working, and what isn’t working. Such knowledge is critical for making decisions which can increase your chances of success. There are a number of effective email marketing techniques out there. There are techniques for building email lists, arousing interest, generating leads, closing sales, reselling to existing customers, etc. Most of the techniques are standardized and quite commonplace. For instance, when arousing interest, you can use free offers, discount coupons, testimonials from current users, and so on. The challenge isn’t with mastering marketing techniques. The challenge is adapting them to your specific needs. This is where most email marketing campaigns get it wrong – they fail to adapt existing techniques to the unique characteristics of their target customers. As a result, their marketing efforts struggle to produce tangible results. 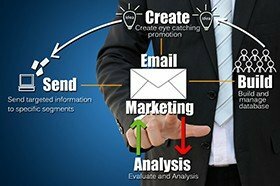 Successful email marketers are adept at adapting marketing techniques and strategies to their target audience. This means that they first take time to understand the target audience i.e. preferences, needs and unique attributes. Upon understanding the audience, they adapt the marketing techniques to suit the audience’s unique characteristics. If you desire to succeed in email marketing, you need to take this approach. These are the main email marketing best practices. Of course, as is the case with any other aspect of online marketing, email marketing needs to be aimed at achieving specific objectives. Examples include brand enhancement, improving sales, increasing market share or even selling affiliate products. When carried out against the backdrop of well-articulated objectives, these email marketing best practices can be a key driver of success. Therefore, if you desire to maximize the impact of your email marketing, simply define your objectives, and then use these best practices to supercharge your marketing campaign. Need an effective email marketing strategy to help promote your company brand, products or services? We can help. Just call our office today at 303-200-1000 to speak to one of our online marketing consultants to help you get started. You can also email our team at sales@seozones.com or fill out and submit the form on this page to request more information about our unique email marketing services! By doing so, you can also receive a FREE website analysis!